Ever read “Who Moved My Cheese”? 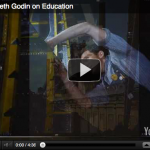 That book comes to mind when you see this quick interview with Seth Godin, as he talks about his viewpoint of what is really happening today in Detroit. HINT: It may be starting in Detroit, but it’s moving rapidly across the US.